Gorakhgad is a good trekking getaway from Mumbai. Located near Murbad, there is a fort at the Summit. Named after Saint Goraknath, the fort is at a height of 2150 ft. above sea level. 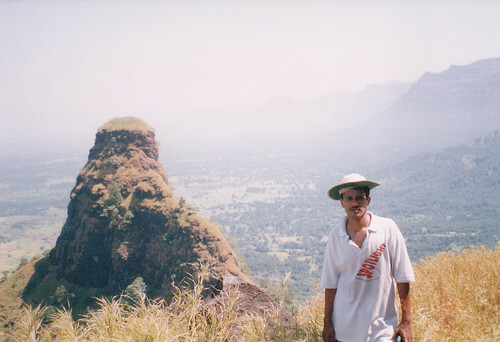 While it is not a very big trek, it is fun to climb and the view of the twin pinnacles Machindragad and Gorakhgad from the top is worth making the trip. 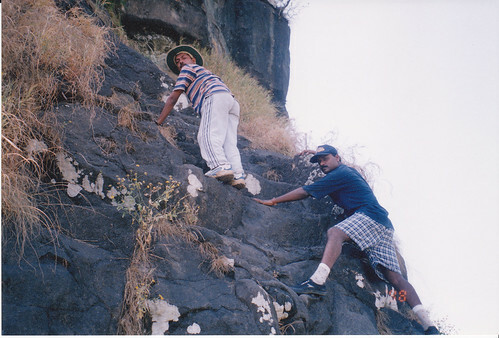 The climb in the last stages to reach the summit is indeed thrilling. 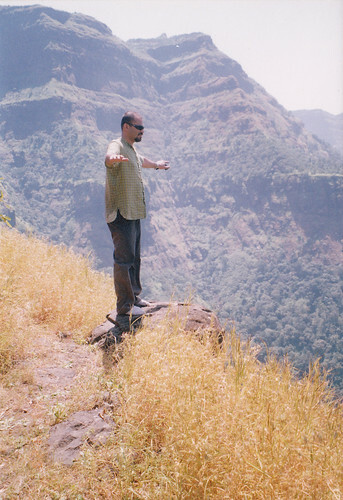 Gorakhgad is approachable from Murbad. We took a fast local from Dadar to Kalyan. State Transport buses are the best way to get further. We first took a bus to Murbad from Kalyan. Then another bus from Murbad got us to Dehri. Deshmukhwadi is where the base camp is. 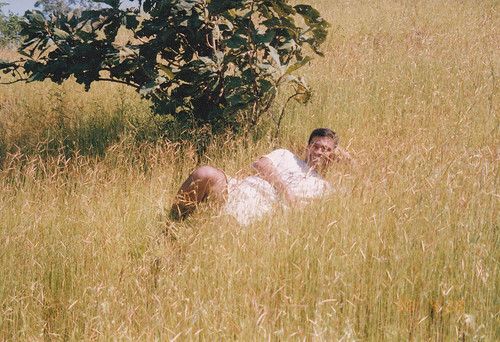 There is a Temple of Gorakshanath where you can take a breather before commencing the climb. We met a gentleman here who ran a small lunch stall and offered even to deliver us at the top! We gladly accepted and ordered lunch which was to be delivered in the cave on top after a couple of hours. We took the blessings of Lord Krishna and Rukmini before proceeding on our trek. A friendly dog started following us and we did not mind as it looked to have been sent by Krishna to guide us! Gorakhgad was patrolling station during Maratha Era and served as a stopover point while travelling from Naneghat to Junnar. It served as a vital link between two critical forts, Fort Durg towards the north-east and Fort Siddhagad to the south-west. The Fort was named after Saint Gorakshnath after he meditated here. The trail starts behind the Gorakshanath Temple and it’s a meandering route till the first plateau. As we took a small break, we noticed the dog was still with us and so we shared some snacks with it! The yellow grass all around is very enticing to roll over upon. The route from here onwards was full of scree so we had to exercise a little more caution. We encountered a second plateau after which our bodies seemed to have warmed up to the exercise and we were making good time. The dog had no issues and looked like he was accompanying us right till the top. We found a small temple just before the base of the summit. It has a Shivaling and rocks dabbed with vermillion. It is like an oasis with ample shade and drinking water. So we took a short break as were told the real climb to the top is just ahead! The climb became steeper and challenging from here onwards. Next we found a gateway with an underground spiral staircase behind it. There is a steep climb required to reach a narrow terrace on top. As you enter the Fort, two cisterns are visible. Further up there are an intriguing set of caves carved out of the Pinnacle. They are a welcoming sight for all weary trekkers, especially so in the summers! It is large enough to accommodate 2 dozen folks. There is a Mahadeo Temple with a Nandi right at the top of the fort. The view from the top is spectacular. You can catch Machindragad, Sidhhagad and Ahupe Ghat. Machindragad was really mesmerizing with its imposing posture. As we proceeded towards the Cave for a short nap, we found a familiar figure waiting for us. Lunch was ready for us. Cave Delivery was a real high in customer service! The return journey takes just about 1.5 hrs, although we had to be more careful with the scree and the sharp turns. The faithful Dog waved its tail as goodbye and went back to the Vittal Temple having done its duty! 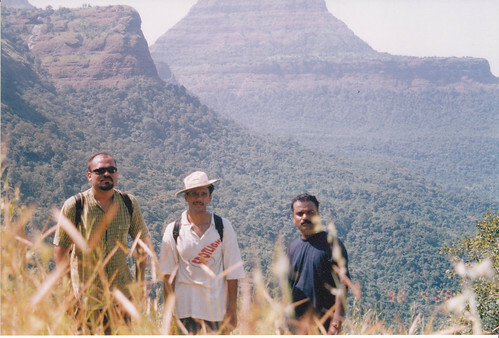 Gorakhgad remains one of the best value for money treks in the Sahyadris! You get magnificent views form the top for having climbed for just a couple of hours. The steep gradient ensures it is not a walk in the park either! Nice trek report. It seems you visited the place long time back. Yes, i got hold of some old snaps and wrote this! Good you clarified [shock] I had been to Gorakhgad last month and the place looked very different. It's a wonderful monsoon trek. Do you remember doing the climb from the cave to the top and how difficult it was? 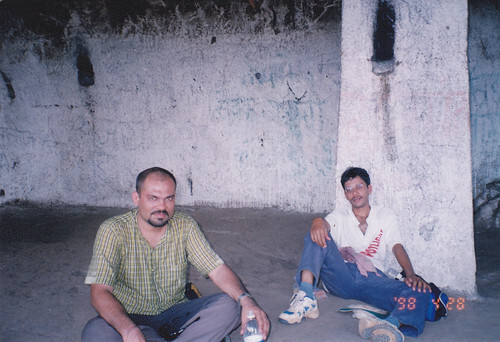 When we went, all groups had stopped at the cave and told us that it would be impossible to reach the top (heavy rains and fog) and we took their word for it. Oh! but the fun is on top. We have done that once in late summer and the other in winter. Monsoon might be tough, yes. I did it in monsoon and went till the top. There is a small temple and great view. It's a Good report with Nice pictures! Would like to visit it once. Don't you think, it's a bit of tricky climb even if it wasn't monsoons? @Flash Gordon, also is there a valley to the other side of the climb in the picture no. 2 you have posted? [whoa]Looks scary to me.